Samos ( Greek: ) is a Greek island in the eastern Aegean Sea, south of Chios, north of Patmos and the Dodecanese, and off the coast of Asia Minor, from which it is separated by the 1.6-kilometre (1.0 mi)-wide Mycale Strait. It is also a separate regional unit of the North Aegean region, and the only municipality of the regional unit. The area of the island is 478 km2 (184.6 sq mi) 43 km (27 mi) long and 13 km (8 mi) wide. It is separated from Anatolia by the approximately 1-mile-wide (1.6 km) Mycale Strait. While largely mountainous, Samos has several relatively large and fertile plains. A great portion of the island is covered with vineyards, from which muscat wine is made. The most important plains except the capital, Vathy, in the northeast, are that of Karlovasi, in the northwest, Pythagoreio, in the southeast, and Marathokampos in the southwest. The islands population is 33,814, which is the 9th most populous of the Greek islands. The Samian climate is typically Mediterranean, with mild rainy winters, and warm rainless summers. Samos relief is dominated by two large mountains, Ampelos and Kerkis (anc. Kerketeus). The Ampelos massif (colloquially referred to as "Karvounis") is the larger of the two and occupies the center of the island, rising to 1,095 metres (3,593 ft). Mt. Kerkis, though smaller in area is the taller of the two and its summit is the islands highest point, at 1,434 metres (4,705 ft). The mountains are a continuation of the Mycale range on the Anatolian mainland. According to Strabo, the name Samos is from Phoenician meaning "rise by the shore". In classical antiquity the island was a center of Ionian culture and luxury, renowned for its Samian wines and its red pottery (called Samian ware by the Romans). Its most famous building was the Ionic order archaic Temple of goddess Hera—the Heraion. Concerning the earliest history of Samos, literary tradition is singularly defective. At the time of the great migrations it received an Ionian population which traced its origin to Epidaurus in Argolis: Samos became one of the twelve members of the Ionian League. By the 7th century BC it had become one of the leading commercial centers of Greece. This early prosperity of the Samians seems largely due to the islands position near trade-routes, which facilitated the importation of textiles from inner Asia Minor, but the Samians also developed an extensive oversea commerce. They helped to open up trade with the population that lived around the Black sea as well as with Egypt, Cyrene (Libya), Corinth, and Chalcis. This caused them to become bitter rivals with Miletus. 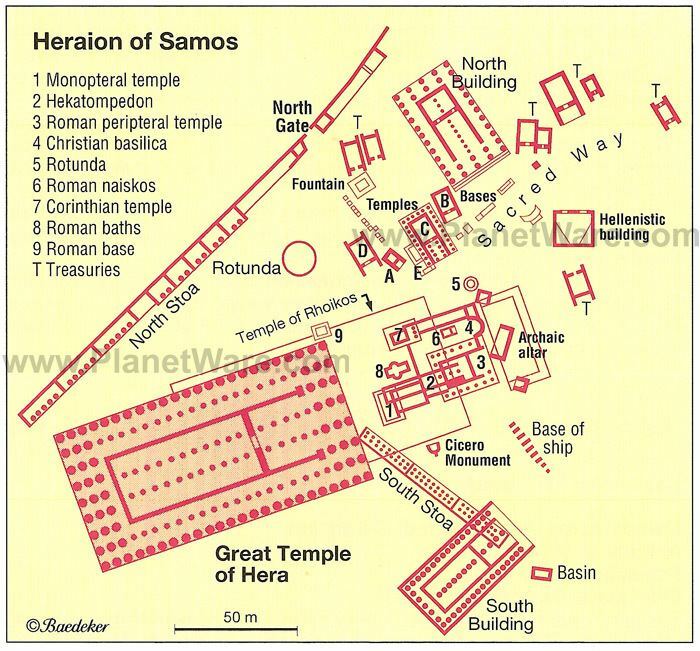 Samos was able to become so prominent despite the growing power of the Persian empire because of the alliance they had with the Egyptians and their powerful fleet. The Samians are also credited with having been the first Greeks to reach the Straits of Gibraltar. The feud between Miletus and Samos broke out into open strife during the Lelantine War (7th century BC), with which we may connect a Samian innovation in Greek naval warfare, the use of the trireme. The result of this conflict was to confirm the supremacy of the Milesians in eastern waters for the time being; but in the 6th century the insular position of Samos preserved it from those aggressions at the hands of Asiatic kings to which Miletus was henceforth exposed. About 535 BC, when the existing oligarchy was overturned by the tyrant Polycrates, Samos reached the height of its prosperity. Its navy not only protected it from invasion, but ruled supreme in Aegean waters. The city was beautified with public works, and its school, of sculptors, metal-workers and engineers achieved high repute. In the 6th century BC Samos was ruled by the famous tyrant Polycrates. During his reign, two working groups under the lead of the engineer Eupalinos dug a tunnel through Mount Kastro to build an aqueduct to supply the ancient capital of Samos with fresh water, as this was of the utmost defensive importance (since being underground, it was not easily detected by an enemy who could otherwise cut off the supply). Eupalinos tunnel is particularly notable because it is the second earliest tunnel in history to be dug from both ends in a methodical manner. With a length of over 1 km (0.6 mi), Eupalinos subterranean aqueduct is today regarded as one of the masterpieces of ancient engineering. The aqueduct is now part of the UNESCO World Heritage Site, the Pythagoreion. After Polycrates death Samos suffered a severe blow when the Persian Achaemenid Empire conquered and partly depopulated the island. It had regained much of its power when in 499 BC it joined the general revolt of the Ionian city-states against Persia; but owing to its long-standing jealousy of Miletus it rendered indifferent service, and at the decisive battle of Lade (494 BC) part of its contingent of sixty ships was guilty of outright treachery. In 479 BC the Samians led the revolt against Persia, during the Battle of Mycale, which was part of the offensive by the Delian League (led by Cimon). During the Peloponnesian War (431–404 BC), Samos took the side of Athens against Sparta, providing their port to the Athenian fleet. In the Delian League they held a position of special privilege and remained actively loyal to Athens until 440 when a dispute with Miletus, which the Athenians had decided against them, induced them to secede. With a fleet of sixty ships they held their own for some time against a large Athenian fleet led by Pericles himself, but after a protracted siege were forced to capitulate. It was punished, but Thucydides tells us not as harshly as other states which rebelled against Athens. Most in the past had been forced to pay tribute but Samos was only told to repay the damages that the rebellion cost the Athenians: 1,300 talents, to pay back in installments of 50 talents per annum. At the end of the Peloponnesian War, Samos appears as one of the most loyal dependencies of Athens, serving as a base for the naval war against the Peloponnesians and as a temporary home of the Athenian democracy during the revolution of the Four Hundred at Athens (411 BC), and in the last stage of the war was rewarded with the Athenian franchise. This friendly attitude towards Athens was the result of a series of political revolutions which ended in the establishment of a democracy. After the downfall of Athens, Samos was besieged by Lysander and again placed under an oligarchy. In 394 the withdrawal of the Spartan navy induced the island to declare its independence and reestablish a democracy, but by the peace of Antalcidas (387) it fell again under Persian dominion. It was recovered by the Athenians in 366 after a siege of eleven months, and received a strong body of military settlers, the cleruchs which proved vital in the Social War (357-355 BC). After the Lamian War (322), when Athens was deprived of Samos, the vicissitudes of the island can no longer be followed. Perhaps the most famous persons ever connected with classical Samos were the philosophers Pythagoras and Aesop. In 1955 the town of Tigani was renamed Pythagoreio in honor of the philosopher. Other notable personalities include the philosopher Epicurus, who was of Samian birth and the astronomer Aristarchus of Samos, whom history credits with the first recorded heliocentric model of the solar system. The historian Herodotus, known by his Histories resided in Samos for a while. There was a school of sculptors and architects that included Rhoecus, the architect of the Temple of Hera (Olympia), and the great sculptor and inventor Theodorus, who is said to have invented with Rhoecus the art of casting statues in bronze. The vases of Samos were among the most characteristic products of Ionian pottery in the 6th century. The Samian economy depends mainly on agriculture and the tourist industry which has been growing steadily since the early 1980s. The main agricultural products include grapes, honey, olives, olive oil, citrus fruit, dried figs almonds and flowers. The Muscat grape is the main crop used for wine production. Samian wine is also exported under several other appellations.